Home » Category "Window treatments tips"
Professional curtain cleaners excel at cleaning intricate pieces and fine fabrics. After careful inspection, fabrics are tested to determine the most appropriate cleaning method. Draperies that need to be cleaned should only be dry-cleaned. 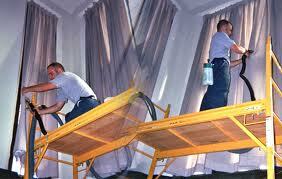 Some curtain cleaning services take down draperies and transport them to their place of business. Here, the cleaning process used, removes soil, odors, pollen, smoke, and dust. The service will guarantee the drapes are returned with no shrinkage, even hems, and parallel pleats. Specialists re-hang the drapes with the utmost care. Others avoid having an office of home exposed while draperies are out. Professionals have equipment specifically designed to clean draperies. The process can be done in the home or office. A solvent, that is specially formulated, is injected into the drapery. The solvent is administered under pressure then extracted from the fabric, leaving the drapes in clean condition. No shrinkage or damage to the fabric occurs during the process. When a professional decides what clean process is best to clean curtains, the fiber content of the fabric and the dye fastness are taken into consideration. A synthetic hydrocarbon solvent is the product most frequently used by technicians, because it is nonflammable. This solution cannot be used with dyes that will fade or bleed. A soft non-aggressive solvent is used on fabric prone to dye problems or color loss. The paradox to this solution is that it is gentler than detergent but flammable. It can only be used where fire precautions are taken. It is not toxic and can be hung to dry in a ventilated space where fire precautions are in place. If cleaning instructions instruction have the symbol ‘P,’ perkcholorethylene is used to clean curtains. Professionals refer to the cleaner as ‘Perk.” It has to be used in the cleaning facility because tumble drying is required, and the toxic fumes are collected in a sealed machine. If the fabric has water born stains, soap and water are added to the solvent to remove them. Mechanical action, heat, and moisture can cause shrinkage. A clothing press is used to finish the curtains. Curtains made of very heavy material and difficult to take down may be steam cleaned in the home or business. Technicians start at the top of the curtain and work down. Technicians know how far to keep the appliance away from the fabric to prevent it from becoming too wet. Steam can burn. Professionals wear protective clothing, appropriate for the job. Hot water extraction is used on curtains that are not harmed by large amounts of water. The method is gentle on fabric while effective in dirt and dust removal. A combination of special solution and hot water cleans stubborn stains. Ninety-five percent of the combination, along with the dirt from the fabric, is extracted back. This method requires some time to dry fully. What Are Window Treatment Services? Window treatments are a form of personal expression. That does not mean you have to do the work yourself. A company offering window treatment services helps to create a look perfect for your home or business. Crafted window treatments finish a room and frame the view. Trim, hardware, and finishing details will complete the process that yields a beautiful, functioning, lasting window treatment that complements the lifestyle of the client and the décor of the home or business. The designs range from eclectic to traditional, contemporary to country. Working with a window treatment service takes the confusion and worry out of the process. The focus of creating custom window treatments is to provide both decoration and functionality. Accessories such as pillows and cushions can add to the design. Window décor enriches a home. Window treatment needs are met with solutions ranging from efficient solar screens to fine draperies. Bedroom and living room décor is greatly influenced by window treatments. A casual style that offers a decorative accent to a room can be accomplished by simple curtains that are light in color or layers of sheers. For an elegant and refined finish, use velvet drapes paired with sheers. Cornices give the allusion that windows are bigger than they are. The stationary toppers add extra elegance. Coordinate the texture and color of area rugs and pillows with window treatments for a cohesive look. Accent pillows are a welcomed addition to any bed or sofa. They provide easy seasonal updates. 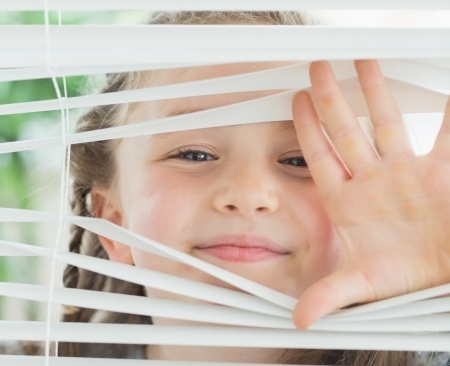 Adding shades or blinds offers privacy. Sliding panel shades are a popular option for walls of glass or large windows. Another large window or sliding glass door window treatment is vertical honeycomb shades. They have insulated cellular air pockets. The most elegant shades are soft vertical shades that combine vertical blind vanes and soft sheer fabric that provides greater light control. Certain window treatments create different décor and style effects of a room. Woven window shades enhance a living room by giving it a sophisticated, yet casual look. When looking for a quick way to freshen up a kitchen without too many changes, consider the addition of valances to windows. They make a tremendous impact. Valances are a popular treatment idea when floor-length draperies are not practical. Only the top portion of a window is covered. Countless styles and fabrics are available. Poles, rods, or boards can be used to mount them. They can be used in conjunction or without drapery panels. Valance options include fusing existing treatments, creating your own, or custom designs. The scope of a project is determined by style, shape, and budget.